The years that followed have brought only misery, he said, looking at photos of three of his sons killed in attacks in the ensuing chaos. Baghdad: Fifteen years ago, Abu Ali was thrilled to see American soldiers enter Baghdad. "The tyrant is finished," he remembers saying, imagining a bright future for Iraq without Saddam Hussein. But the years that followed have brought only misery, he said, looking at photos of three of his sons killed in attacks in the ensuing chaos. 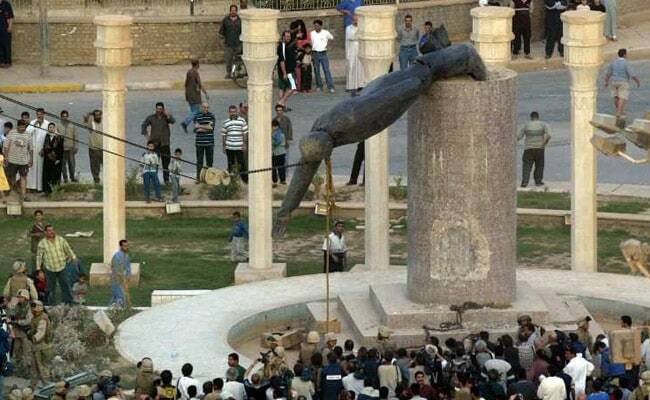 After the US-led invasion of 2003, Iraq, freed from nearly a quarter century of dictatorship, descended into violence. Sectarian clashes and jihadist attacks divided families and killed tens of thousands of people, leaving behind wounds that have yet to heal and a lagging economy. In July 2007, Abu Ali's eldest son, 18 at the time, was killed when a car bomb hit a busy street in Baghdad's Karrada neighbourhood. He had been selling watermelons to passers-by trying to escape the summer heat. Six years later almost to the day, the taxi driver's two younger sons, Alaa, 23, and Abbas, 17, were also killed in an attack. The losses are written in deep lines along his face, aged well beyond his 61 years. Abu Ali used to dream of lives for his children that would be better than his own, but now he only visits them at the cemetery. "I go to their graves every week, I feel like they're sitting near me," he said, wearing a white scarf and a traditional beige robe. Abu Ali's hopes for a brighter future have faded. "The situation does not bode well... no one thinks of the people," he said. "The parties only seek to win seats." Things were different before, said Qais al-Sharea, a hairdresser in the capital. "Saddam Hussein was the strong man, the one who controlled everything and scared the entire world with his chemical weapons," he said. Each morning, when he opened his salon in Al-Ferdous Square in the heart of Baghdad, the dictator's colossal statue stood guard outside. On April 9, 2003, Sharea, who had stayed at home that day, watched on television as US soldiers with an armoured vehicle helped a crowd armed with a sledgehammer pull down the bronze statue in front of his shop. "Baghdad fell when the statue fell," he told AFP at the foot of the giant platform, now covered with rubble poorly hidden by crumpled sheet metal -- the site of a construction project that has so far failed to take shape. Sharea, 27 at the time, thought "like all young people" that Baghdad would soon be filled with nightclubs and restaurants. "We (thought) we would travel the world," he said. But instead of progress and opening to the world, life in Iraq has turned into a case of "one step forward and five back", said Sharea. Mahmoud Othman, a 65-year-old Kurdish politician who served as a member of Iraq's transitional leadership after Saddam's fall, dreamed of a better tomorrow. But if "the Americans had a plan to overthrow Saddam Hussein, they had no agenda for post-Saddam", said Othman, who had been a Kurdish peshmerga fighter since the age of 18. State institutions and Saddam's all-powerful Baath Party were dismantled as opposition figures returned from exile. But corruption and sectarian tensions -- fuelled by militias born in the security vacuum created by the dismantling of the security forces -- flourished. "We thought we'd have a federal and democratic system, but we've had sectarianism and chauvinism," said Rauf Maaruf, leader of the Kurdish opposition party Goran. Members of Iraq's religious and ethnic minorities say they have paid the highest price for the past decade-and-a-half of chaos. "Our country has been going through catastrophe after catastrophe," said the Chaldean Catholic patriarch, Louis Raphael Sako, who has watched his community shrink. Every institution has been affected, according to Abdel Salam al-Samer, a 58-year-old university teacher for the past three decades. "The situation in Iraq has deteriorated and so have our universities," said Samer, who has seen political factions interfere in education and colleagues killed by militias.